The telephone is my favorite way to sell. Get me on the phone and I’ll find a way to make it happen. Don’t go telling me the telephone doesn’t work anymore. The people who are saying that are simply afraid to have a conversation. 1. When speaking to a receptionist or gatekeeper, before they connect you with who you’re trying to reach, ask, “In case we get disconnected, what’s their extension?” I love this as the gatekeeper often hears it as you doing them a favor, and at the same time, it allows you to get the direct number. 2. When ending a call, ask the person for the best number to reach them. Often they will give you a different number than you reached them on originally, and it now allows you to have two numbers by which to contact them. 3. Stop talking! Silence is even more powerful on the telephone than face to face. When you’re silent, it invites the other person to talk. 4. Visually describe a report, marketing materials, etc. As you’re talking about the information, invite the person to either screen share or do a video connection as a way to discuss in depth and move the conversation along. 5. When looking to get a time set for the next phone call, rather than asking them for a time, be proactive and say, “Let’s do 10 AM next Tuesday, assuming that works in your schedule.” Being proactive places more emphasis on them making sure the time works to meet. 6. Immediately upon ending the call, send the person either a text or an email with a next step or to ask a question. The objective is to keep the conversation going by learning one more piece of information and, at the same time, opening up another line of communication. 7. Finally, be focused. As tempting as it is to try and read emails or look at something else while talking on the phone, the more focused you are, the more you’ll hear. Being focused also allows you to take better notes while the phone call is underway, rather than trying to remember after the fact. There are a lot of people saying the telephone doesn’t work as a sales tool anymore. I’m amazed at how often I’m asked about this issue, so I hope the above tips are helpful! Don’t allow not having a phone number stop you. 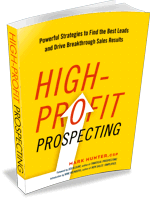 In my book High-Profit Prospecting, I spell out a number of ways to get a phone number, so be sure to grab a copy of it today!